Decades ago a US political cartoonist conveyed a key problem with journalism as we know it. Basically, the illustration showed a male reporter leaping out of bed and lacing up his shoes, while overhead a sky full of missiles marked “Political Spin” streaked onwards to their target. The cartoon caught journalism’s key dilemma… that by the time it can respond with qualifiers and researched rebuttals, the spinmeisters have already hit their target, and done the damage. Helped on by the fact that passive reportage provided the platform and the megaphone for the lies that the journalists must now attempt to undo. In fact, as Juan Cole has pointed out, 41% of Germany’s energy needs actually come from renewables (wind, solar, biomass, hydro) and this figure is on track to reach 50% by 2030. Meanwhile, the German government says it gets only 9% of its energy needs from Russia, not 70%. Yes, it has important energy links with Russia. But “captive?” Hardly. Ditto for Trump’s claims that the US is paying 70–90% of the cost of defending Europe. In fact, the US is paying only 22% of NATO’s $2.8 billion common budget. True, if you do tally all the defence spending of all of the NATO allies, then the US would account for about two thirds of that aggregate, but this reflects the cost to the US economy of it maintaining its military bases and force projection capacity all around the world, the Asia-Pacific included. Comparing that US global spend to what NATO spends in Europe is a false comparison. Even then, Trump’s demand that NATO countries should each spend 4% of their GDP on defence is totally excessive, given that the US donates only 3.3% of its GDP to the Pentagon. Tough on Europe over trade, at the G-7. Tough on Europe over defence, at NATO. 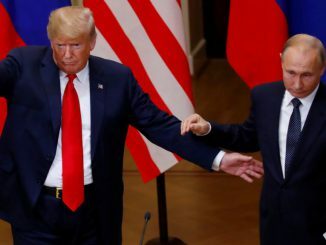 And utterly smitten as usual by Vladimir Putin at the Helsinki summit. Hard to pick what the weirdest aspect of this meeting was – was it Trump winking at Putin, the praise for Putin’s reliability, the green light given by Trump to Russia’s policies in Syria… or was it Trump’s failure to even mention the Crimea or Ukraine or the Skripals? Tough call, but my bet for the most bizzarro moment came when Putin offered Russian investigators to help out with the probe into Russia’s role in the 2016 US election, an offer that must rank alongside OJ Simpson’s pledge to find the real killer. Trump welcomed it, of course. To the dwindling few who still profess to believe in this Trump /Putin liaison, it will be seen as being all about forging good relations with Russia, and negating the vested interests of the Deep State (and Crooked Hillary!) in maintaining the antagonisms of yesteryear. WelI, if there were genuine trade-offs involved that might be a defensible argument. Yet Trump’s concessions (and his apparent inability to even comprehend the issues on which he is conceding) have made this a one-way street for Putin, as it was recently for Kim Young-Un as well. Meanwhile, Kim is quietly cranking up his nuclear capability. Media : Mr Peters, how do you feel about being called New Zealand’s own version of Donald Trump by Nigel Farage? Acting PM: Well, I noticed the medium that carried that. Media: He’s a friend of yours, right? How do you feel about being called the New Zealand’s own version of Donald Trump? Interesting that even then, Peters chose to respond to the Trump comparison by swivelling back to Farage and Brexit – which he portrayed as something brought about by “ordinary people all round the UK, up against a lot of money…” Given what we now know, this is fatuously ingenuous. The big international money poured into swaying the Leave vote – let alone the blatant lies and false assurances that accompanied it – are all pretty apparent. Similarly, if you’re inclined to follow the journalistic trail… sometimes the persistence pays off. To take just one example among many: Back in January, the McClatchy news service story carried a story about the Russian influence trail involving Russian mobster/banker /money launderer Alexander Torshin and his special assistant, Maria Butina. Last week, this trail culminated in US Justice Department charges being laid against Butina, accusing her of being an agent of the Russian Federation operating in the United States. Here, for the conspiratorially inclined, is the time frame and further details, including the links between Torshin/Butina and the NRA, which reportedly donated $30 million to Trump 2016, at a level 3x what it spent on Romney 2012. This Time magazine story also details the links between Butina and the NRA, and includes a 2015 exchange between Butina and Trump, in which Trump mentioned that if elected, there’d be no need for sanctions on Russia. All of this is not to suggest that Russia influence was the cause of Trump being elected. Yet the evidence that Russia did meddle in the US election of 2016, with the aim of seeing Trump elected is now substantial, and undeniable. As is the subsequent agenda of Trump to break up the Western alliance in Europe –on trade and defence – which is something of direct benefit to Putin. Footnote: If the Republicans are worried, disturbed and distressed about Trump’s disastrous foreign policy adventures and apparent collusion with Putin, when are they going to start voting against him in Congress on anything that’s substantial? Maybe – crazy notion – they could cease blocking attempts to force the release of Trump’s tax returns?